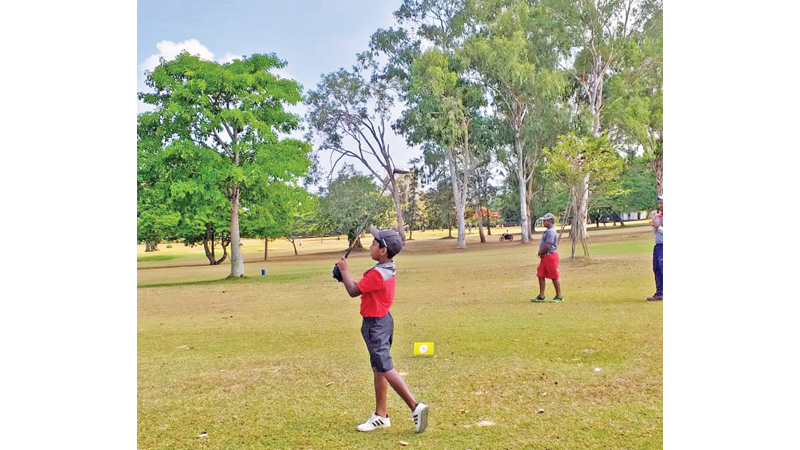 The Sri Lanka Junior Golf Match-Play Championship 2019 reached the final stage with four top seeds in the Gold Boys, Gold & Silver Combined Girls, Silver Boys and Bronze divisions entering the finals apart from C. Dharaniyan, the top seed in the Copper division who was beaten by Varun Fernando 4 & 3. Varun’s comprehensive victory was no fluke when in the quarterfinal he edged out Thejas Rathis Kanth (4th seed) in a closely fought match. Varun seeded fifth meets Ayaan Gunasekera the second seed, who comfortably entered the final of the Copper Division beating Kaiyan Johnpillai 4 and 2 in the other semi-final. The 9-hole final for the age group 9+ & under juniors promises to be a super battle for the Rukmani Kodagoda Trophy Copper Division Championship. Haroon Aslam cruised through to the final of the Gold Division and Junior champion title, with an emphatic 8 & 7 victory over Dilshan Malinda and now meets S. Dhuwarshan from NEGC who beat P.A. Dimuthu of Victoria Golf Club 2 down on the 18th hole. In the Gold & Silver combined Girls division the two sisters Taniya and Sherine created history to become the first sisters in Sri Lanka to enter a final in golf. Taniya Minel the more accomplished player is expected to win but if she doesn’t take her younger sister seriously, anything can happen. Nirekh Tejwani seemed unstoppable in the Silver Division for Boys when he beat Chethana Perera 8 & 7 and qualified to meet K. Danushan in the final. Danushan overcame the challenge of big-hitting Levon Niyarepola 2 & 1. The final will be a repeat of 2018 and Danushan may find it tough to change last years’ result, with Nirekh playing even better golf this year. Kaya Daluwatte stamped her authority as the ‘rose’ among the ‘thorns’ when she defeated Kvahn Tejwani (4th seed) emphatically by a 4 & 2 margin to reach the Bronze Division final played over 14 holes. In the second semi-final Reshan Algama beat Shanal Binuksha in a humdinger of a match by the narrowest margin 1 up. Reshan proved his metal to handle the pressure very well to overcome Shanal to enter the final and meet top seeded Kaya Daluwatte. The P & S Bakers sponsored 2019 Sri Lanka Junior Golf Match-Play Championship enters the final stage, and promises five fantastic finals for five Junior champions to emerge in the five different age group categories.